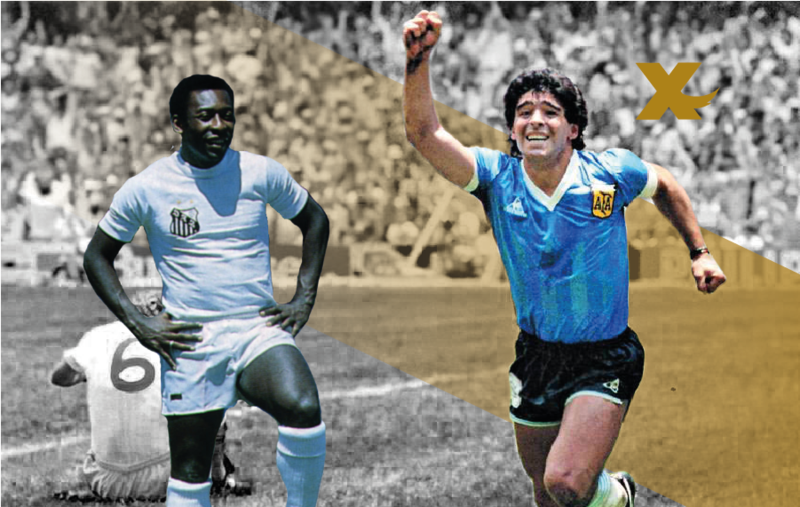 You are at:Home»Football Stories»Who was greater: Pele or Maradona? This is a question which divide millions of people throughout the decades without having a specific answer. Both players are considered two of the best football players ever existed, both broke records and had many individual and non-individual achievements and trophies. That’s why coaches, fans and analysts try to compare and find out who is better considering many factors as medals and honors, level of competitive football ands goals. Pele or Edson Arantes do Nascimento has played for Santos, New York Cosmos and for Brazil’s National Team in a total of 21 years (1956-1977). On the other hand, Diego Armando Maradona had a career that lasted for 24 years in various clubs, Boca Juniors, Barcelona, Napoli, Argentina National Team, Sevilla and Newell’s Old Boys. Concerning the statistics Pele had 763 club matches and 707 goals in those matches, while Maradona had 588 club matches, in which he scored 312 times. On a national level Pele had 92 appearances and 77 goals on a ration of 0.8, and on World Cups he had 14 matches in which he scored 12 goals. On the other hand Maradona had 91 appearances and 34 goals on a ration of 0.3, and on World Cups he had 21 matches in which he scored 8 times. Pele though has won the World Cup 3 times, while Maradona won the cup 1 time. Both players have countless achievements two of these that both players share are the FIFA World Cup Golden Ball and the FIFA Player of the Century. After having a quick look on these statistics and considering also other parameters, like the level of football in each league that they played, who is greater in your opinion?